Recognized as the last remnant of New Castle’s abundant agricultural history, Penn Farm is thriving once again under the day-to-day management of its current tenant, Delaware Greenways, but the future of the farm’s oldest structure, a farmhouse whose first section was built between 1799 and 1810, is now in question. “It just has to sit there for now,” says Mike Alfree, secretary of the Trustees of the New Castle Common, the organization created by the sons of William Penn in 1764 to oversee more than 1,000 acres set aside for common use in and near the historic town. In 1792, the trustees developed guidelines for subdividing the land into farms. Those rules made the tenants responsible for building their own homes on the farms and making other improvements as well. John Crow, a trustee who owned a tavern on Delaware Street, became the first tenant of what is now Penn Farm in the late 1790s and built the wood-frame first section of the townhouse. Between 1814 and 1828, he expanded the house with another wood frame section and a brick addition. In the late 19th or early 20th century, an attached wooden shed was added. In its more than two centuries, the farm served multiple purposes. Wheat, corn and oats were its major crops for much until late in the 19th century, when the lower level of the large barn was converted for dairy use. Over time, the other farmland managed by the Trustees passed into other uses. The large-scale transition, beginning in the 1940s, made way for the New Castle County Airport, the Penn Mart Shopping Center, the Center Point Industrial Park, William Penn High School, Wilmington University and communities like Penn Acres. Penn Farm endured, but its size contracted and, in 1973, Joseph Quigley III, a third-generation tenant, sold off his dairy herd because he could no longer grow enough grain to feed the cows. As the 21st century dawned, Penn Farm’s stature had dwindled, the best evidence of its history being a farmstand on Frenchtown Road, which primarily sold produce grown on other farms in the area. Elaine Quigley, widow of Joseph Quigley III, moved off the farm in 2010, a year before the Trustees struck a deal to have Delaware Greenways take over day-to-day management of the farm. At the time, the Trustees and Greenways contemplated transforming the farmhouse into a combination office and residence, thinking that Greenways could hire a fulltime farm manager who would live on site. That idea hasn’t been abandoned, Alfree says, but it’s not likely to happen anytime soon. “We’re not likely to have a windfall,” he says, explaining that the Wilmington-based Buck Simpers Architect + Associates put a $1.2 million price tag on restoring and reconfiguring the structure for those purposes. The Trustees’ real estate holdings generate about $1.5 million annually in revenue, Alfree says. Nearly half of that helps supports agencies in New Castle, and property maintenance consumes another $400,000 to $450,000 a year, he says, leaving the Trustees short of the funding levels needed to move ahead with the project. According to Alfree and Thomas Clayton, the trustee who serves as the farm’s maintenance coordinator, much of the farmhouse’s interior has been gutted, part of an asbestos removal project, but the building is receiving necessary care. “We make sure there are no leaks. There are termite inspections. We do maintain it that way,” Clayton says. As directors of an organization that traces its roots to a 1701 land grant from William Penn, Alfree says the Trustees are sensitive to the issue of “demolition by neglect,” the practice of some developers of letting historic properties deteriorate to the point that they become too costly to restore, and then replacing them with new revenue-generating structures. 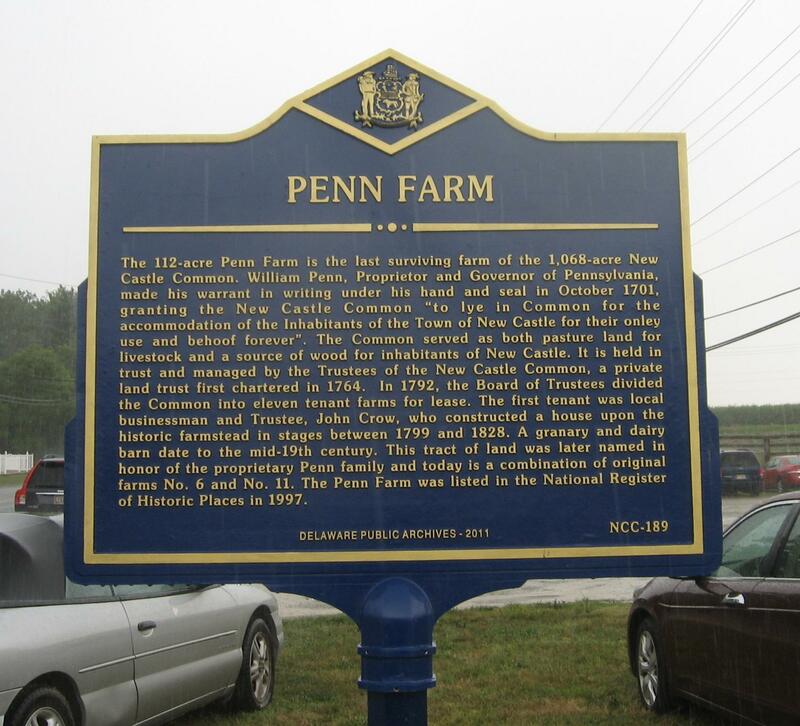 Penn Farm was placed on the National Register for Historic Places in 1997. Some Trustees have mentioned a less-expensive alternative to restoration, building a replica of the farmhouse, Alfree says. Plans have been developed to follow that path in Brandywine Hundred, where the crumbling Forwood School, built in 1799, will be torn down and replaced by a replica. Preservationists have cited the Forwood matter as an example of demolition by neglect, but some of them have acknowledged that there is now no better alternative. The Trustees do not have a timeline for determining the future of the farmhouse. As for the rest of the property “the stewardship Delaware Greenways has been providing has been fantastic,” Alfree says. The easiest way to explain the arrangement, which runs until 2021, is that the Trustees remain responsible for the infrastructure on the site and Greenways handles day-to-day matters, managing the property, caring for the buildings and scheduling event on site. “The Trustees don’t have the expertise to manage the farm, nor do we want to be the manager,” Alfree says. As for Delaware Greenways, “we don’t have our hands in the dirt either,” says Mary Roth, the group’s executive director. As the “managing tenant,” Greenways has leased some 60 acres, more than half the property, to Hunter Marie Farm, headed by longtime New Castle County farmer Paul Lester, who is growing corn, wheat and soybeans. William Penn High School’s Farm to School enterprise takes up another eight acres and Against the Grain Farm leases about seven acres. Several other farmers have leased smaller plots, Roth says.